The Christmas story comes to life through age-appropriate puzzles, activity pages, and 50 reusable stickers in this friendly and fun sticker and activity Book featuring The Beginner’s Bible classic art and simply written content. The Beginner's Bible A Christmas Celebration Sticker and Activity Book by Zondervan is wonderful! My kids absolutely loved this sticker and activity book! They enjoyed coloring the pictures, completing the seek and finds, connecting the dots, mazes and much much more. Their favorite part of the book was finding the stickers to complete the pictures. The stickers are adorably cute and go right along with the true meaning of Christmas. 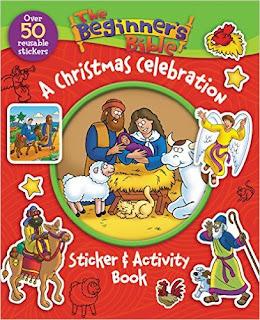 My favorite thing about The Beginner's Bible A Christmas Celebration Sticker and Activity Book besides being about the birth of Jesus is that the stickers are reusable. I can't tell you how fast my kids use up stickers so I love that the stickers are reusable and that my kids can move them around and have loads of fun playing with them throughout the book. 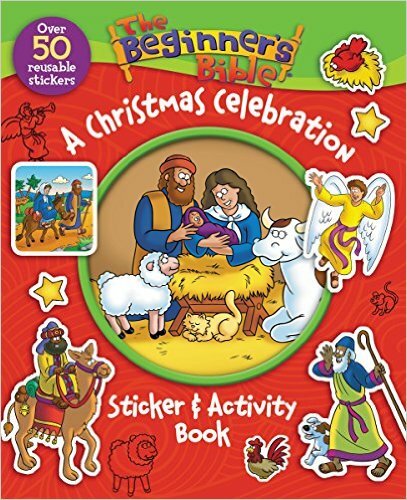 The Beginner's Bible A Christmas Celebration Sticker and Activity Book would make a terrific gift this holiday season! You can find The Beginner's Bible A Christmas Celebration Sticker and Activity Book at Zondervan, Amazon, Barnes and Noble and other bookstores.